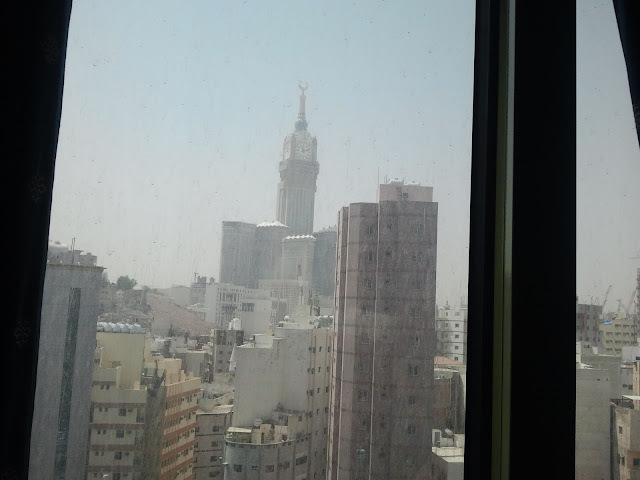 View of the now famous clock tower (other than the other famous clock tower) taken from my hotel room window and it served to remind me of where I was at that moment ... Makkah Al Mukarramah! A place where all human beings who professed Islam as their religion had in their hearts and by the grace of Allah to be here once in their lifetime to complete the 5 Pillars of Islam ...not counting those who had continuous opportunities to come here though. I have put on hold for so long to publish something about my pilgrimage because I feel there is nothing extraordinary to write about since most of us have gone to perform the haj or the small haj..umrah. At the insistence of my dear sister (she's being at me for so long nagging for some write-up of what's happening while I was there), I will try to jot down some memorable happenings. It was in February 2012 when we received letters from Tabung Haji (TH) both hubby and I were selected and offered to perform this year's haj season (1433H/2012). I was having some doubts about leaving No. 3 and No. 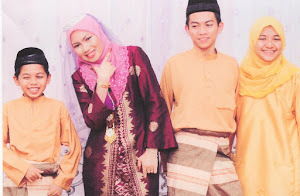 4 'Sunshines' since they will be facing their major exams SPM and STPM come November and No. 1 'Sunshine' is due to deliver her first baby in early October, a few months later No. 2 'Sunshine' told us that the date for his convocation ceremony might be in November too. 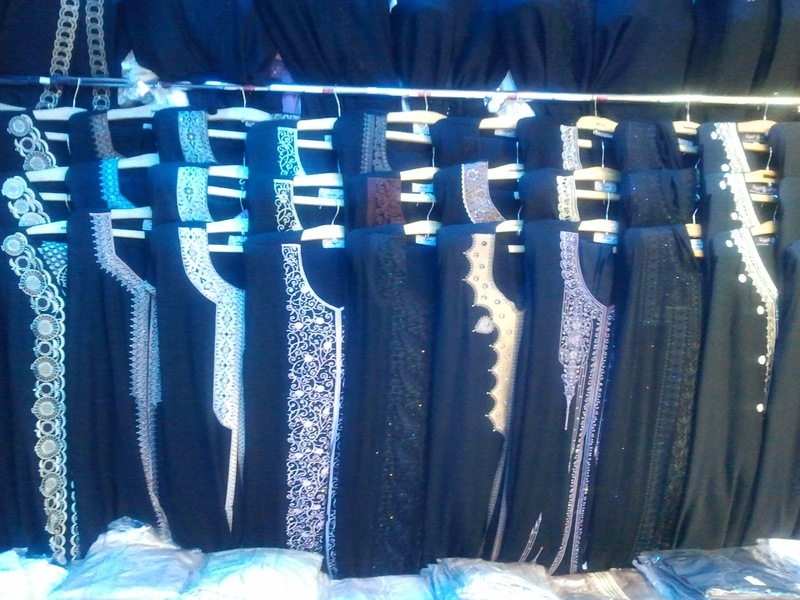 Hubby was steadfast in his decision that come what may we go on haj this year. 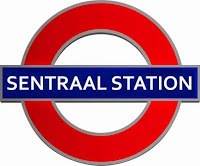 Putting doubts aside we decided to make a plea to TH to put us on an earlier flight citing our personal reasons as above minus the delivery due date of my eldest daughter...that can't be help because she will be delivering her baby before the day for Wukuf. The TH staff to whom we submitted our plea was negative in her answer saying our reason is not strong enough but Allah Knows Best when the schedule date letter from TH arrived we were among the first batch of pilgrims (KT 01) to leave for the holy land on 16 Sept 2012 and be back home by November 1. The bonus of being the earliest among the pilgrims to arrive in Madinah was that Masjid Nabawi was quite deserted for a few days before the exodus below begins..haha. 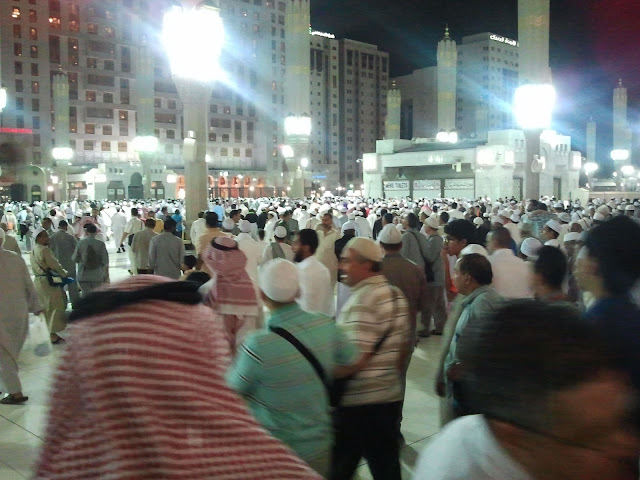 The flight from KLIA flew direct to Madinah and we arrived in the early hours of 17 Sept. at Madinah airport. Had a glimpsed of Masjid Nabawi with all its lights on from above before landing...such a beautiful view. 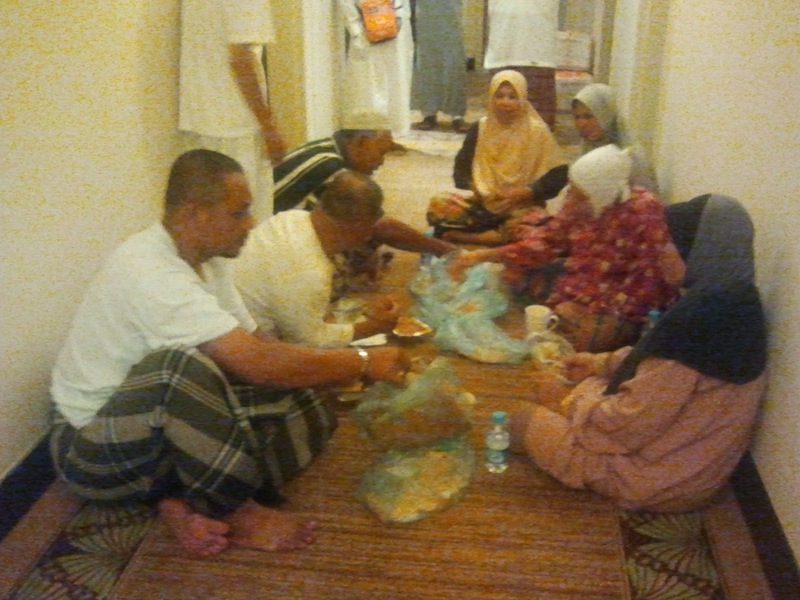 There was a small reception when we arrived at Hotel Movenpick since we were the first pilgrims to arrive from Malaysia. If I am not mistaken KT 01 pilgrims was officially greeted and welcomed by HRH Prince Abdul Aziz bin Majed bin Abdul Aziz, Governor of Madinah. Each pilgrim was handed a small box of dates and tasbih in glittering colourful sachets by the Governer himself just as we stepped off the bus. Cameras started clicking, TV cameras zooming in and female TH officials strewn petals of roses on us as we walked towards the hotel... tak pernah dalam hidup ini disambut sebegitu rupa. We were in Madinah before when we performed the Umrah in the year 2000 (that was in early December and the weather was a lot cooler) and over the years old buildings/hotels were torn down to make way for grander hotels just like in the picture above. The roads are now wider with more new buildings under construction, hubby and I cannot recall which part of Madinah we stayed before. 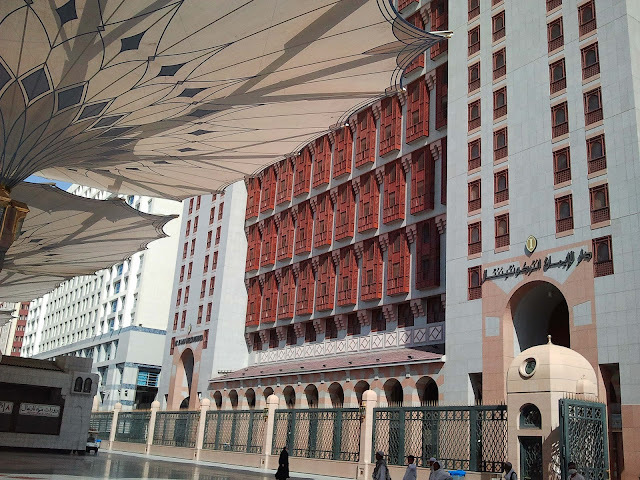 It was a small hotel located somewhere in one of the back streets and was about a 10 minute walk to Masjid Nabawi. I was placed in a room at Movenpick for two occupants and the husband of my room mate shared a room just across ours with my hubby and another male pilgrim. 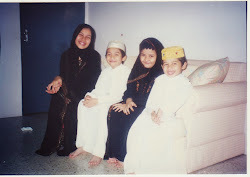 For reasons unknown in Madinah and Makkah I shared rooms with my fellow State man or rather ladies, might be that because more than half of the pilgrims of KT 01 comes from Kelantan. Even though the masjid is just a stone's throw away from the hotel one has to walk across a vast expanse of tiled marble floor to reach the masjid, it was a bit of shock when the hot dry afternoon heat seared my face when i stepped off from the hotel's corridor to enter the masjid for zohor prayers... well it was September and the weather is still hot. 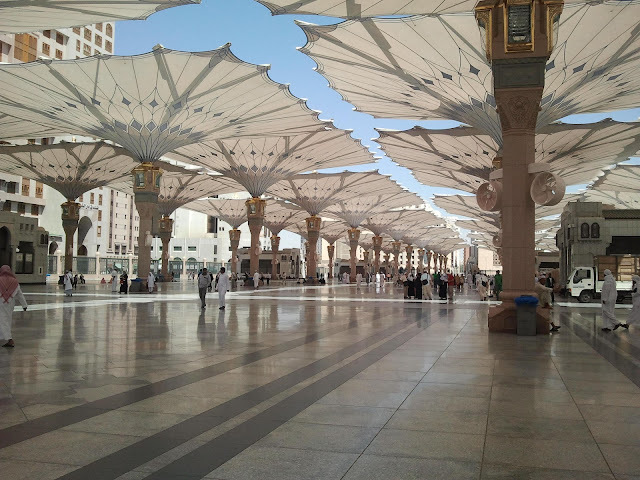 Like I say before, Masjid Nabawi was quite deserted for the first few days before pilgrims from other countries and other KTs from Malaysia (5 KTs a day) started to arrive in droves and I had the opportunity to pray in the first saf (row) at every prayer times. Only 3 days in Madinah and I was already feeling a bit hectic with the prayer times since they were only 3 hours apart except for Subuh and Zohor prayers and falling on the bed to rest for a while between solat was a luxury. 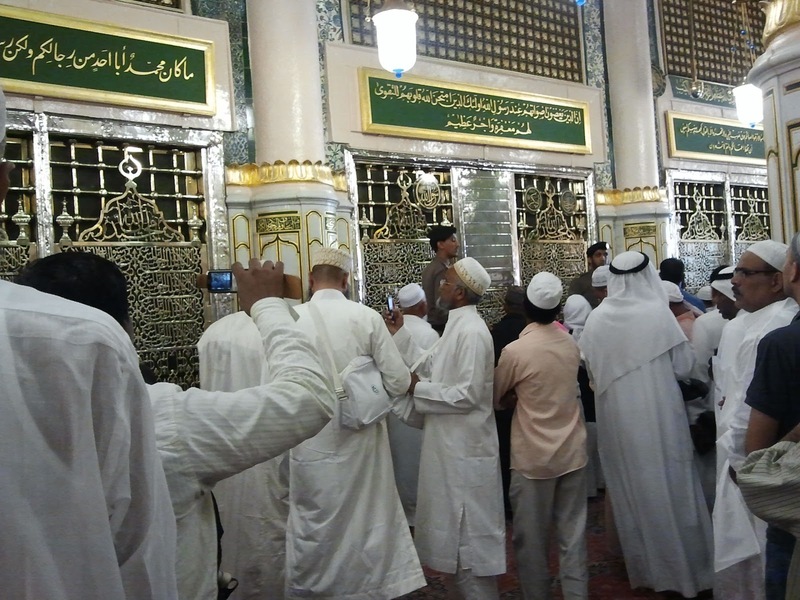 Apart from fulfilling the 40 prayer times over eight days, the visit to our Prophet's mausoleum and Raudah (Garden of Paradise) is of course looked forward. 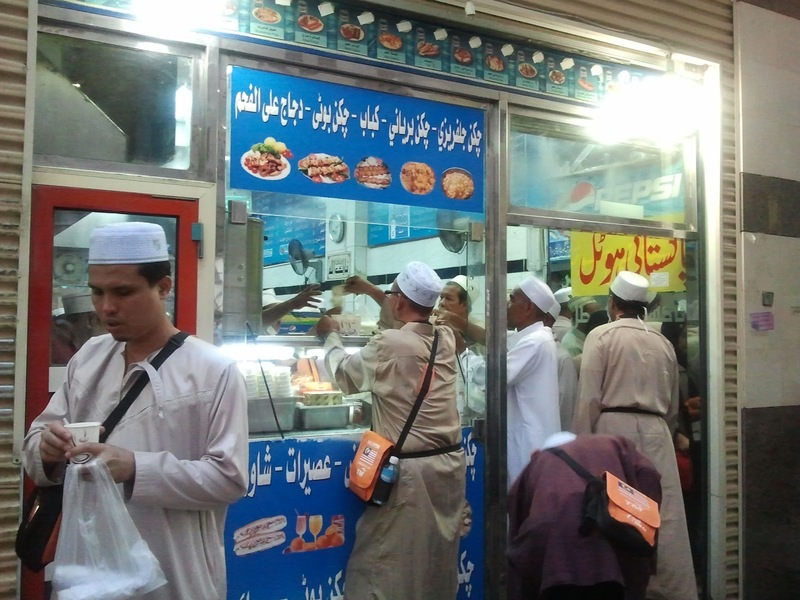 Pics above were taken by hubby picturing the situation at the Raudah, see the men praying on the green carpet. Everyone prays to have a chance to pray on this green carpet as it is said every prayer (doa) you asked for will In Shaa Allah be fulfilled by the Almighty. 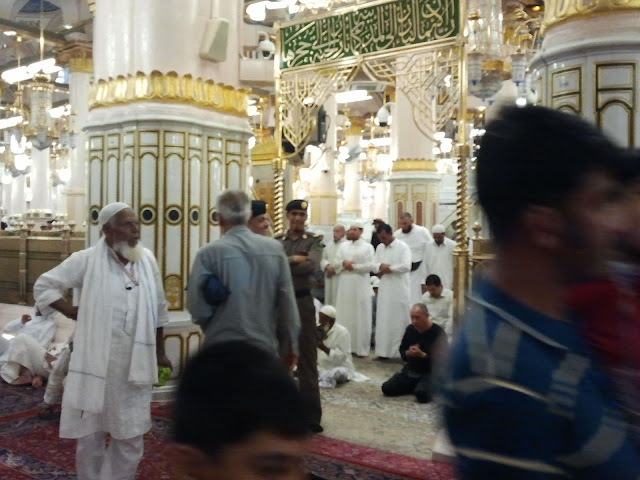 When I was on Umrah twelve years ago there was a very large crowd of women pushing and shoving and I did not get to solat properly but this time Alhamdulillah the crowd was less and I get to solat twice on the green carpet and offered prayers for everyone at home... healthwise, longevity etc. One could not help but feel humbled praying here and tears flow without bidding. 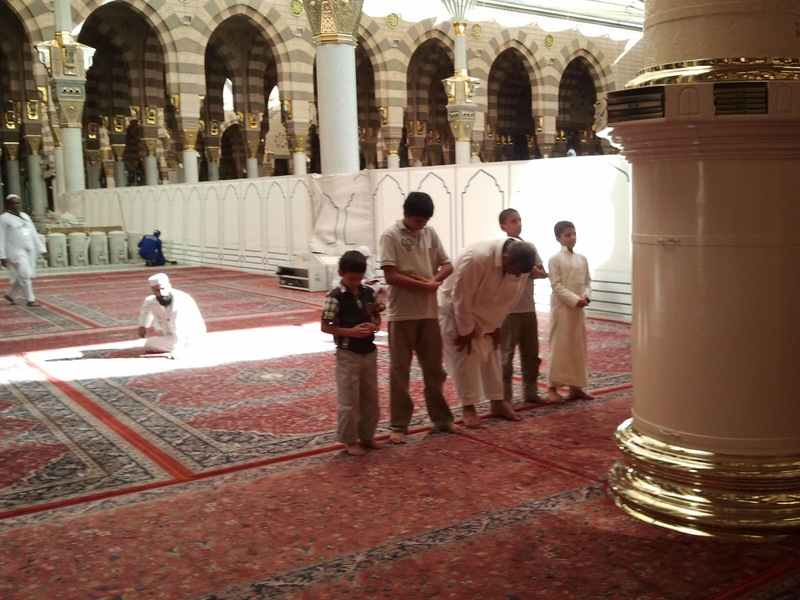 Arab children praying in Masjid Nabawi. 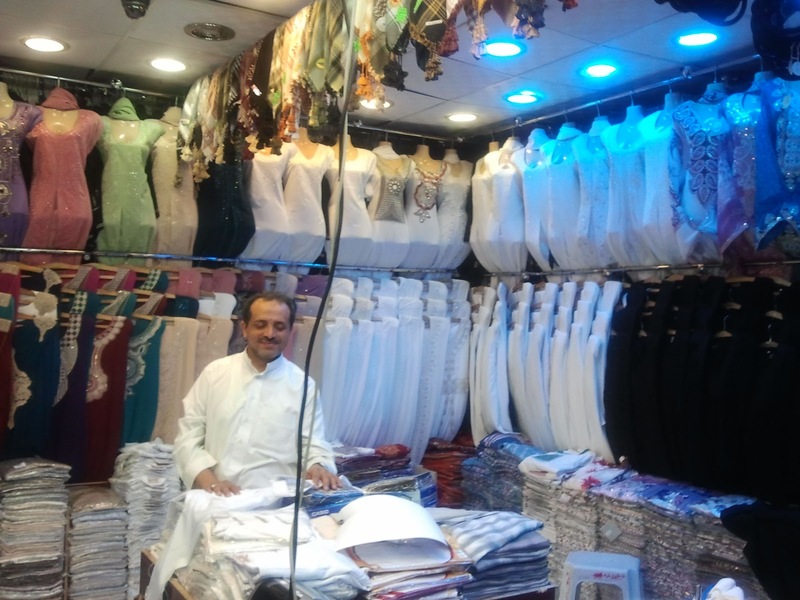 Bab shopping pulak, ramai di rumah pesan baik beli belah di Madinah sebab pilihan untuk jubah cantik-cantik. 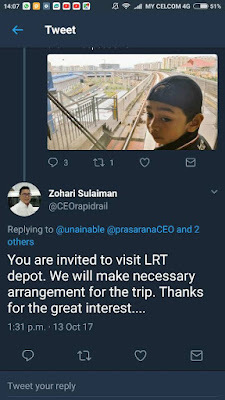 (naik mabuk nak pilih adalah) banyak di sini. 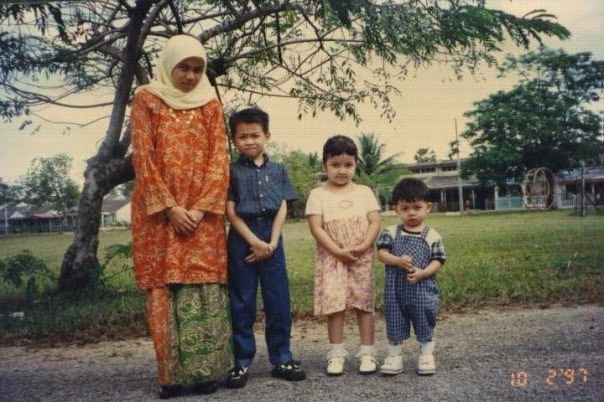 Tok arab dalam gambar bawah ni tau kita orang Malezia....terus tersengih-sengih sebut "Siti Nurhaliza....1 Malezia" ...popular jugok Mek Siti ssano weh hahaha. Biasalah breakfast di luar bilik dengan Che Abe tiap-tiap pagi. Jiran-jiran bilik sebelah pun berkelah rioh rendah tiap pagi. 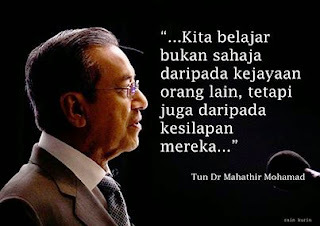 In Shaa Allah Nita masih muda, ada tenaga blh buat haji sekali lagi, its more meaningful than doing umrah. Fantastic write up sis, you are the real writer in our family! short, concise and a very comprehensive tale of your 8 days stay in our beloved prophet's saw city. Alhamdulillah the two of you have performed the mandatory once-in-a-life-time ritual, the most trying and the most unforgettable. I hope you have something special from HIM while you were there. Yes everyone experiences something special. Think about it and you will come to realise what that is. It is like going to a wedding when each one is given a small gift. But HIS gift is special and specific to each individual. No, I suggest keeping to yourself something meant to be very personal. 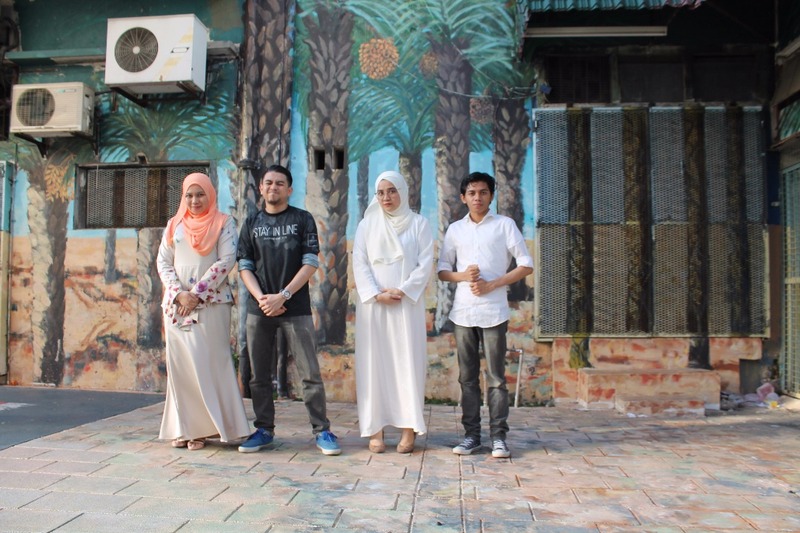 Idea x mari lagi nk sambung kisah once in a lifetime journey kat Makkah pula? ..I remember being humbled when I first set foot in Medinah..within this land lies the prophet...I tried to walk carefully...thinking of another man who stepped down from his camel the moment he arrived...no, he could not ride upon this earth that had entombed God's Apostle...and I remember being astounded at the cleanliness of the streets and boulevards...how dirty was Bachok in comparison...we had our memories, still thinking...God willing, I will be back..